The High Frontier is now on Kindle! At the Space Studies Institute’s Rebooting Space Settlement In the 21st Century sessions at the Space Access Conference 2013 in Phoenix, Arizona, SSI President Gary Hudson has announced the immediate availability of Gerard K. O’Neill’s milestone book The High Frontier in digital format exclusively for Amazon Kindle apps and devices. As SSI Senior Associates, members and friends already know, the original release of The High Frontier was a turning point in how people thought about humanity’s future in space. 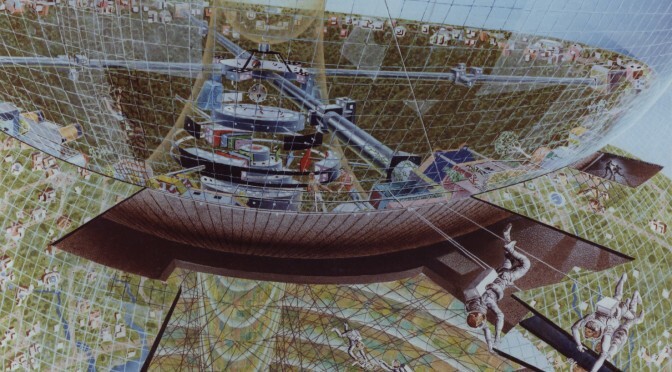 Along with the lasting images of beautiful large scale structures in space, Professor O’Neill emphasized that it was regular real people who could and should be benefiting from the resources available beyond the limitations of the Earth’s surface. The High Frontier tells that story and seamlessly guides all levels of reader to understand the real and required details behind the lofty goals. With the release of the Kindle edition, SSI determined that the very best edition was Professor O’Neill’s original text, plus the added chapter “The View From 1988” which he wrote for the second release of the SSI print version. All of the original Donald Davis artwork and the Pat Rawlings cover art are included and look fantastic even on the E-Ink Kindle devices. The High Frontier Kindle edition will have a nominal list price with proceeds going to support the ongoing work of SSI researchers and projects. A dedicated Kindle device is not required to get the full enjoyment out of the High Frontier Kindle edition. There is a Kindle app for Android, iOS, Windows and Mac and all of them feature the full artwork, the full search capability and the 100% complete text of this monumental book. Go To Amazon.com today for your copy of The High Frontier and help support the important work of the Space Studies Institute. Is there any chance that the book will be released in other e-reader formats? At the moment there isn’t a plan to release The High Frontier on a different electronic format. Kindle has a good cross platform readership and we are happy with the way the text and pictures came out on Kindle (We hope that you are too!). The future is full of possibilities though ;-). As time goes on we will look for more ways to get Professor O’Neill’s vision, and the amazing research work that people and organizations have done over the years in support of that vision, out to people who are ready to grasp it. You can help us by telling friends about both the Kindle AND the print versions. Reading format is a matter of taste and reading environment but the message itself is the most important thing. We hope that you enjoy reading or re-reading The High Frontier.